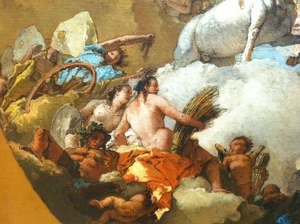 Reading Roberto Calasso’s Tiepolo Pink persuaded me to look carefully, for the first time, at the Tiepolo oil sketches that fill almost a room at the Metropolitan Museum. As ever, I had less time than I would have liked. Was astonished by their upwardness. 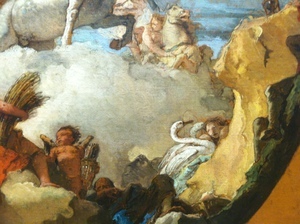 Sense of being drawn up into the sky – the whole company, nymphs and swans and chariots upward, upward, into the vast swirl of the heavens. 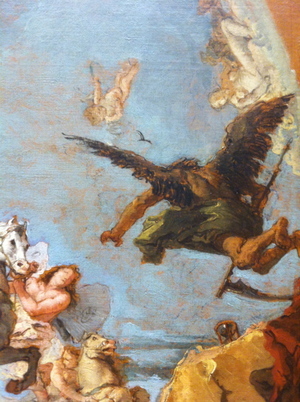 The sensation of time in looking at these oil sketches was very peculiar. In the heavens, the time is divine time, the time of myths and disporting, and this time is circular, though not without sequence. Particular moments have been shown, dramatic moments, but the whole story, known to the gods, if not to us, is implicit there. This is part of the feeling of mystery, the story is known, but it is not clear that it will be known to us, as we might like to believe, “in the fullness of time.” Can’t escape the feeling that these powerful inscrutable faces, intent on the project of carrying forward day and light, are in an intractable relationship with the narrative flow of their story in a way that does not even resemble the way we recount the incidents of our days to one another.